Here’s another beer I purchased (well, okay, the boyfriend bought this one) just because of the name–but it turned out to be quite the beer! Laughing Dog is a microbrewery based in Idaho. It’s a new state for this blog! I must say I’m impressed. I’ll have to try to find some more beers from this brewery. Yes that IS in a plastic cup. I was in a hotel and four of us were sharing, what do you want? 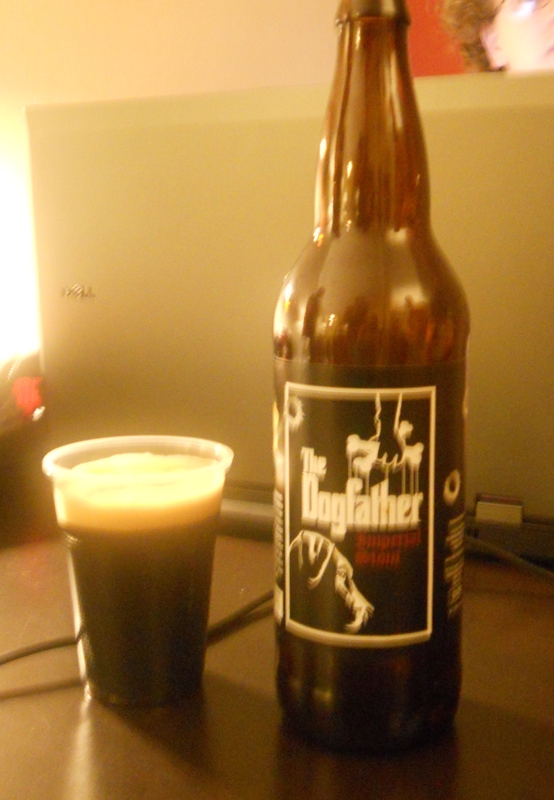 Anyway, The Dogfather is a lovely Imperial Stout, and it was quite good. It has a smokey, chocolatey aroma, and is thick and creamy. It has a smokey/chocolatey taste with a hint of bitterness. While this isn’t the best beer for the gorgeous May weather we were having, it’s still an excellent choice.